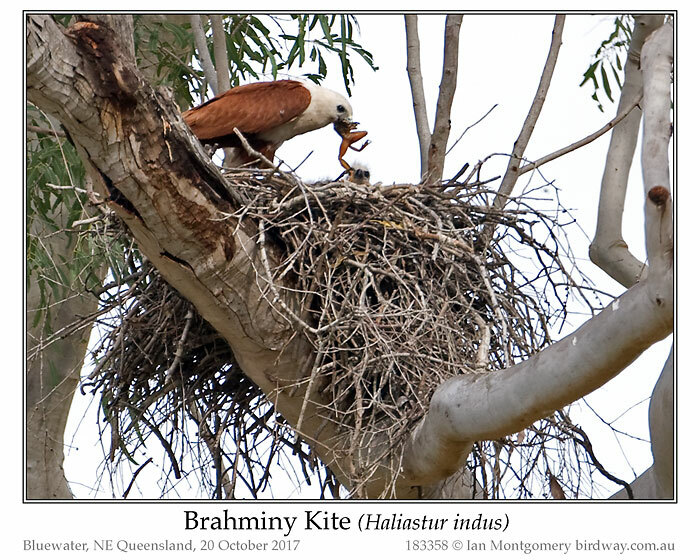 If you can remember that far back, the last bird of the moment was Eastern Grass Owl [http://www.birdway.com.au/botw/botw_584.php] found during a spot-lighting trip to the Townsville Town Common led by local night-bird expert and pillar of BirdLife Townsville Ian Boyd. At the time, Ian was refusing to be discouraged by pancreatic cancer, an attitude that we all admired until his death on 23rd of February. 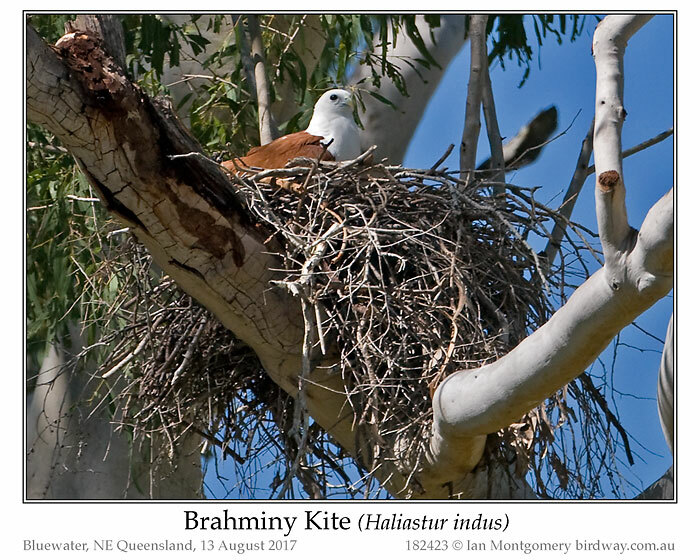 Typically undaunted he gave a presentation on his favourite topic, Night Birds at the BirdLife Townsville AGM on the 10th of February although he had less than a couple of weeks to live. Isolated by flood waters in Bluewater, I couldn’t attend the funeral on 1st March so here is a photographic tribute to him instead. I got to know him well during his last year or and am left with some precious memories of searching for night birds with him. So let’s go birding together while I share three special occasions with you. 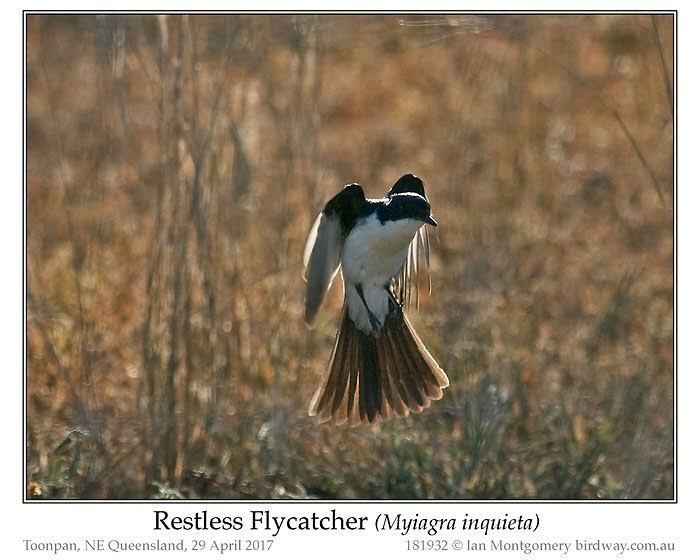 The first was when a birding friend and photographer from Mt Isa was visiting Townsville and wanted to photograph a Rufous Owl. 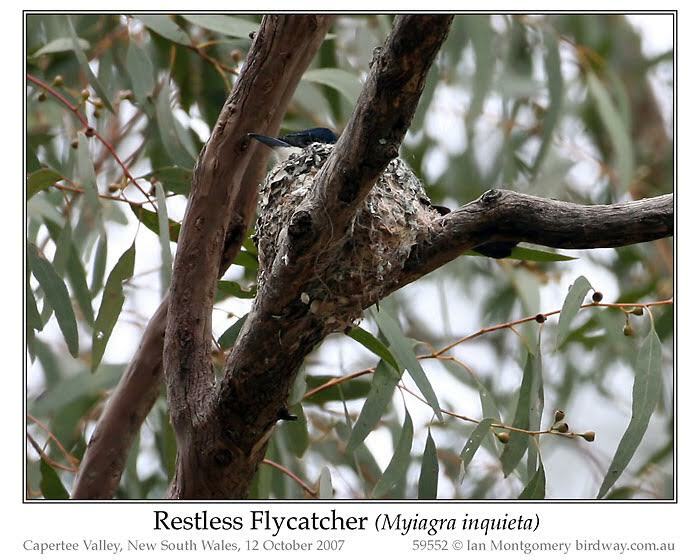 I contacted Ian Boyd and he took us to an active nesting site on a hot afternoon at the end of October. 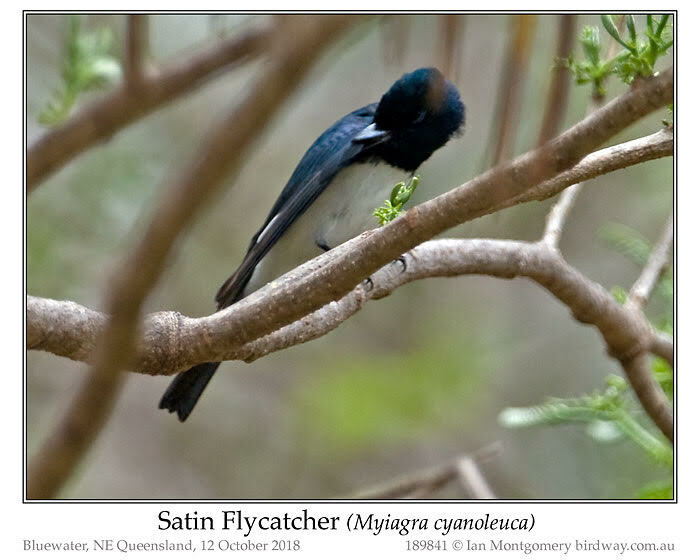 There he showed us the two adults which we photographed (one of them is in the first photo) and our visitor from Mt Isa returned to the site later and got a photo of a fledgling peering out of the tree hollow. 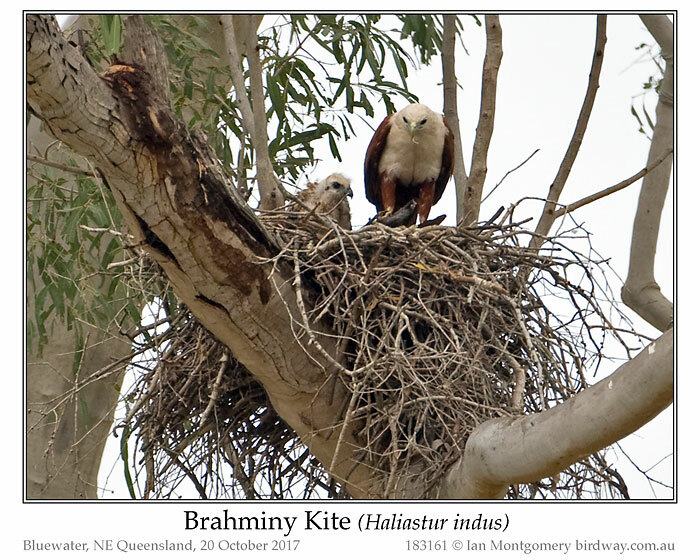 The second was the occasion when we found the female Eastern Grass Owl at the Townsville Town Common which featured as the last Bird of the Moment. At the time our goal was to search for Spotted Nightjars which are supposed to occur occasionally along the Freshwater Track that goes across the grassy, saltbush flats between Bald Rock and the Freshwater hide (see this map:). We drove across the Town Common arriving at Shelley Beach on the northern side at sunset and then drove slowly back in darkness checking for night birds as we went along. 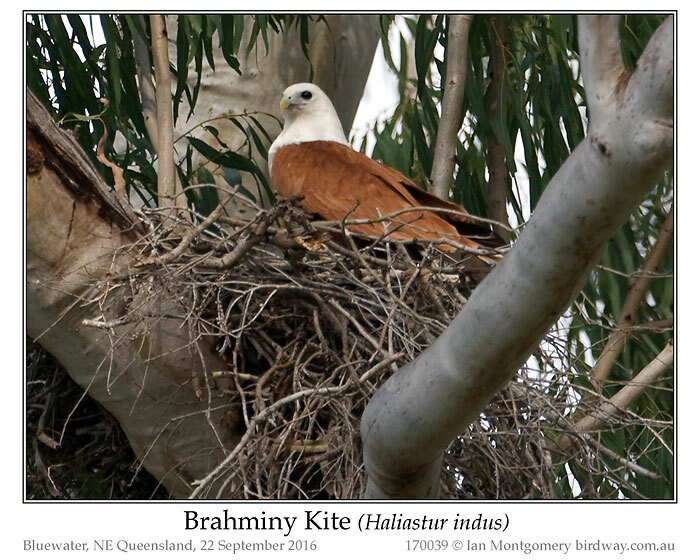 The first stretch of riverine forest on the Shelley Beach Trail produced a remarkable five Owlet Nightjars (second photo) and a single male Tawny Frogmouth (third photo). Male Tawny Frogmouths have silvery grey, strongly marbled plumage. We had only just started along the Freshwater Track when the cry went up ‘Barn Owl’ but we quickly realised that the Tyto Owl beside the track was a female Eastern Grass Owl (fourth photo). There was no sign of any Spotted Nightjars – we suspect that they are more like to be found in the dry winter months – but at the start of the Freshwater Lagoon Road south of the Freshwater hide, we found a Large-tailed Nightjar (fifth photo). This species is the commonest Nightjar around Townsville and is well known for its persistent, loud ‘chop chop’ call that gives it the colloquial name of Carpenter or Axe Bird. Finally, along the track between Payet’s Tower and the Forest Walk, a Barking Owl (sixth photo) represented the only remaining Australian night bird family for the evening – Aegothelidae (Owlet NIghtjars), Podargidae (Frogmouths), Tytonidae (Barn Owls), Caprimulgidae (Nightjars) and Strigidae (Hawk Owls). I’m following the IOC and BirdLife International in lumping the Nightjars and Eared-Nightjars into a single family. We repeated the spotlighting at the Town Common a week later. This time we found one or two Owlet Nightjars along the Shelley Beach Trail, but Tawny Frogmouths were out in force. 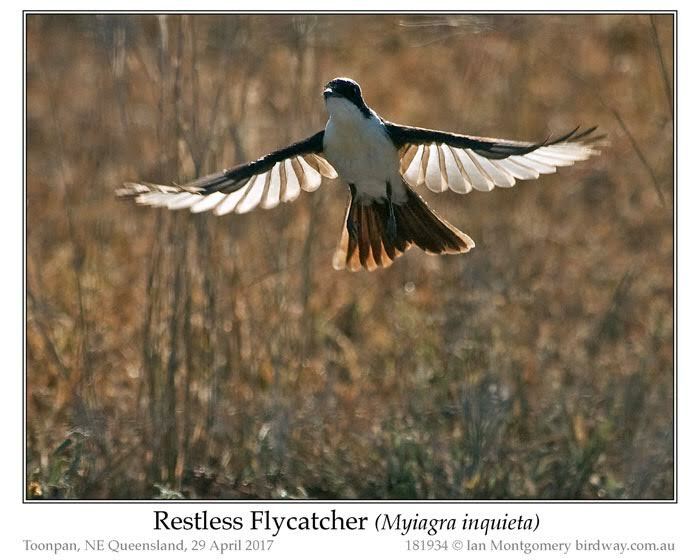 The seventh photo shows a female; females are often rufous like this one but always have plainer less marked plumage than the males. The eight photo shows a remarkably approachable male Tawny Frogmouth. This time there was no sign of the Eastern Grass Owl (or Spotted NIghtjars) and the surprise of the night was a Barn Owl perched in a tree along the stretch where we’d found the Barking Owl the previous week (ninth photo). This bird seemed unbothered by our spot- and flash-lights and when it did leave it did so to plunge into the undergrowth after some prey. That was the last time I went birding with Ian Boyd. He is greatly missed by his wife Robyn, the rest of his family and all us bird watchers who appreciated his generosity, warmth, leadership and enthusiasm. I’ll treasure these great memories of birding with him during his last few months with us. Thank you, Ian Boyd. What a nice tribute to a good friend and fellow birder. What courage for Ian Boyd to continue on under very adverse conditions. Thanks Ian for the neat birds and a memorial to one of your friends. Some weeks ago I went to Toonpan a dry pasture area outside Townsville which is good for dry country birds such as Bustards and often produces unusual birds. 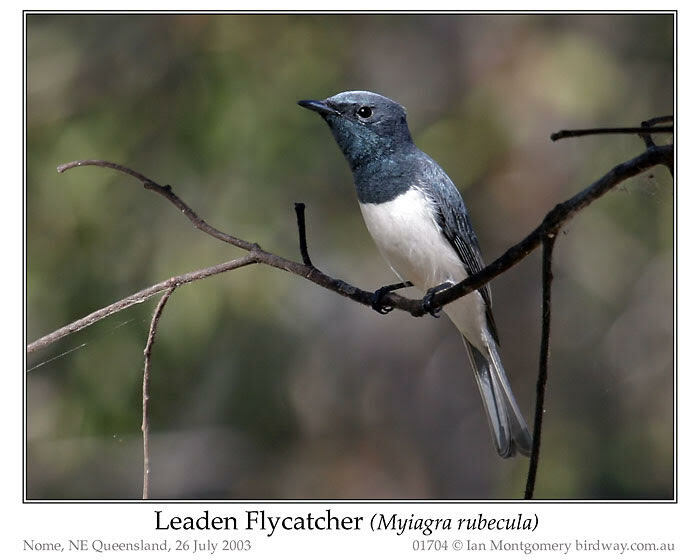 There were a couple of Restless Flycatchers there hawking for insects and I found out later that this species has never featured as bird of the moment, an omission we’ll rectify now. 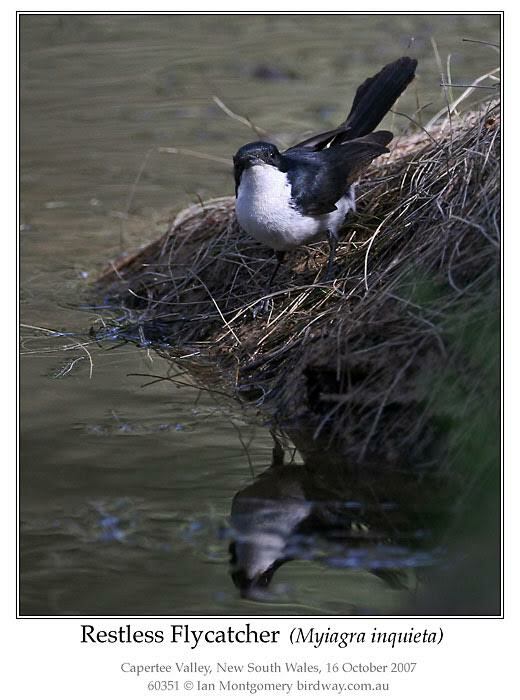 They are dapper birds, smart in their glossy black and white plumage and long tail. 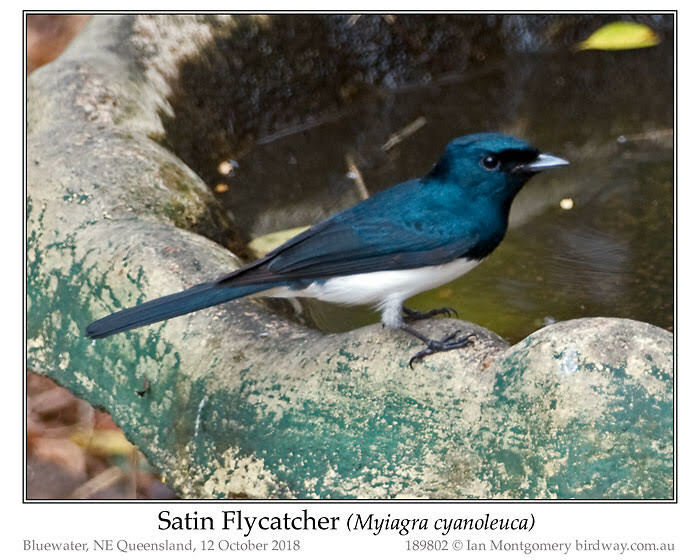 They bare a superficial resemblance to the similarly sized Willie Wagtail, but the species is a member of the Monarch Flycatcher family rather than the Fantails. The nominate larger type inquieta breeds in eastern, southern and southwestern Australia, but not in Tasmania or eastern Western Australia (the Nullabor). 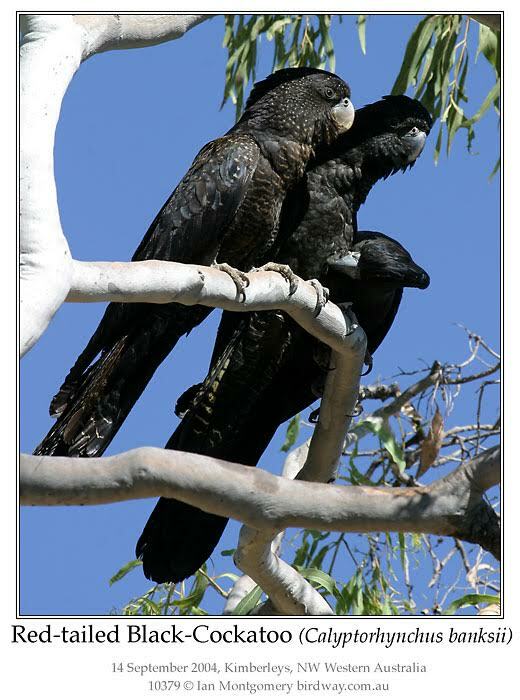 The smaller type nana occurs in northern Australia from northwestern Queensland through the Top End of the Northern Territory to northeastern Western Australia. Taxonomists disagree as to whether these types should be treated as conspecific or separate species. 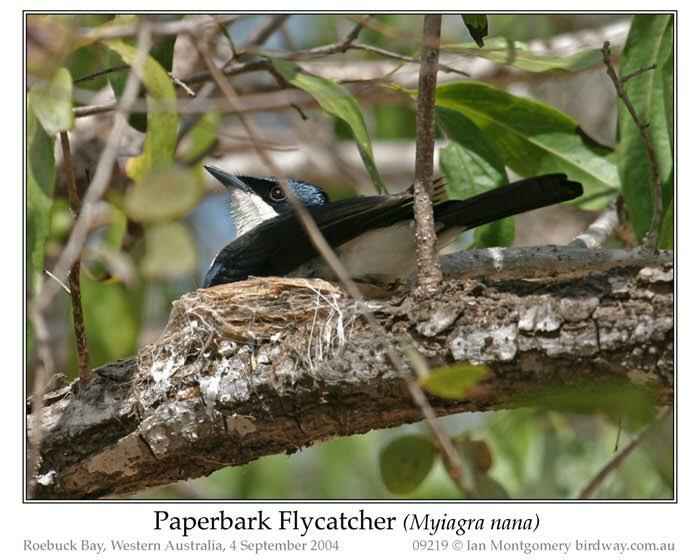 I’m treating them as separate ones here, so ‘Restless Flycatcher’ refers to the southern one, and ‘Paperbark Flycatcher’ to the northern one. 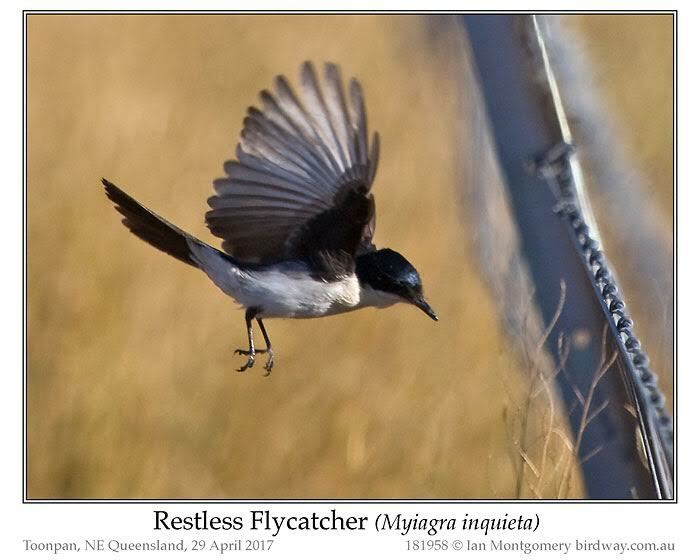 Both are mainly sedentary, but there is some northward movement of the Restless Flycatcher in winter here in northeastern Queensland it is a winter visitor. Restless Flycatchers have a characteristic hovering flight when hawking for insects and this one at Toonpan was doing just this between me and the afternoon sun in the second, third and fourth photos. There were all taken within an elapsed time of one second and in the third one, it is turning away from whatever attracted its attention in the first two. 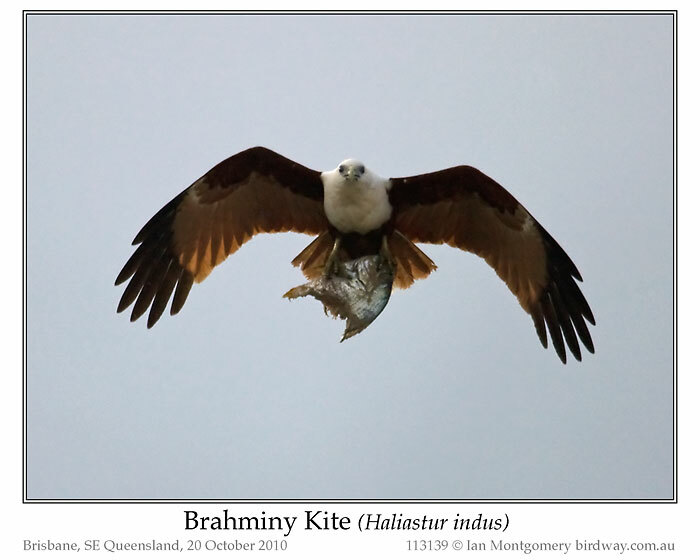 When hawking like this, they make ‘grinding, churring sounds’ (to quote Pizzey and Knight) which are supposed to disturb insects into flight. For this reason, the species is sometimes called the Scissors Grinder. The fifth photo shows one of the two birds checking out the vegetation along a barbed wire fence. It’s not, as it might appear, flying towards the fence. Rather it had been perched on the fence seconds before and is making its way down the side of it. 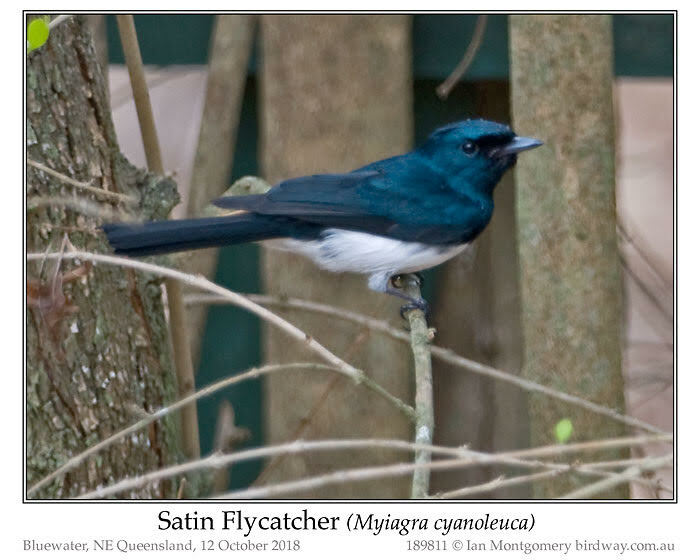 The Restless Flycatcher builds a beautiful nest of grass, bark and spiders’ webs on a horizontal branch, sixth photo with a usual clutch size of three. The nest is typically decorated or maybe camouflaged with lichen. 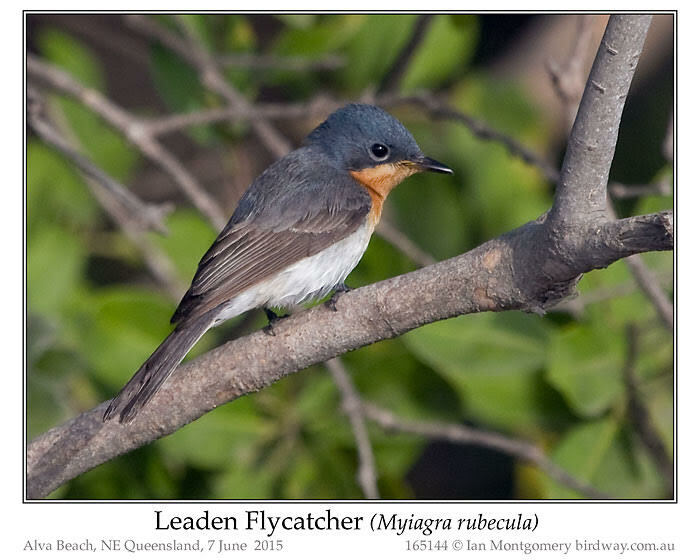 In this photo, you can see the broad, flat bill characteristic of Monarch Flycatchers. 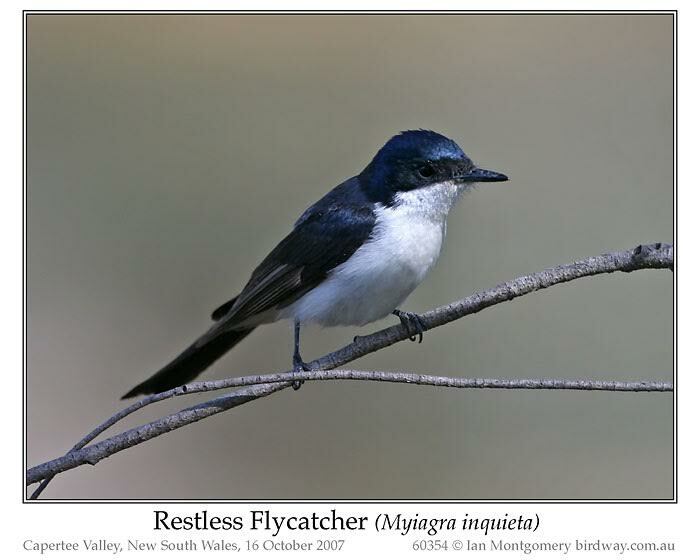 Restless Flycatchers are usually found near water. The one in the seventh photo is having a drink from a river. 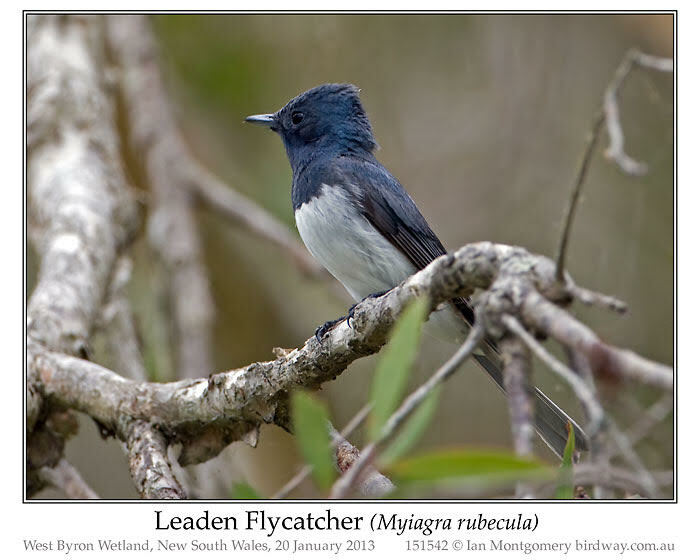 Here is the Paperbark Flycatcher, eight photo. 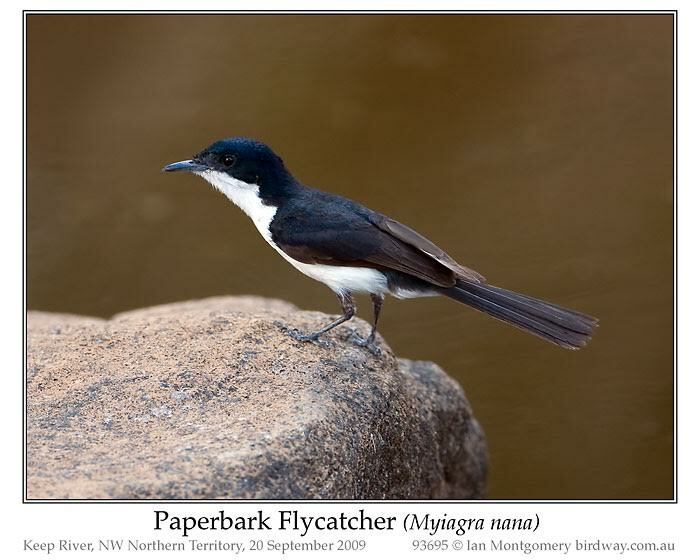 The best way I know to separate it from the Restless Flycatcher is by range, though the Paperbark is smaller (17-19cm versus 19-22cm) and supposed to be glossier and have a darker back. The calls are supposed to be slightly different, though they sound much the same to me. 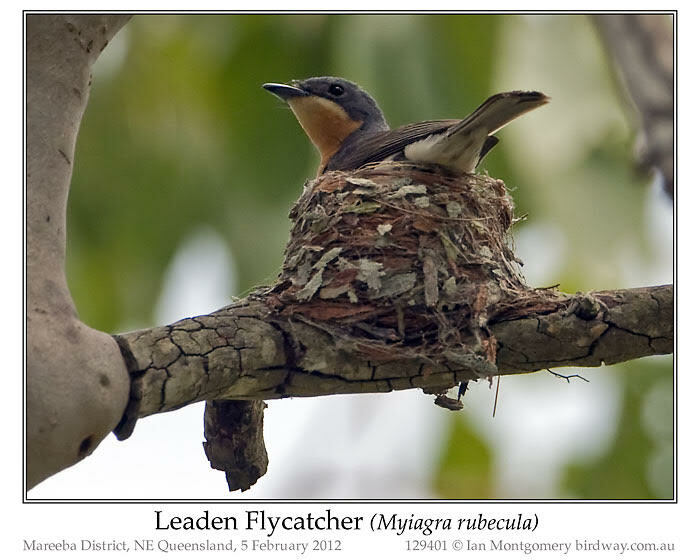 The Paperbark Flycatcher also builds a cup-shaped nest on a horizontal branch, ninth photo, but the sources I have don’t mention bark as building material, or lichen as a decoration. 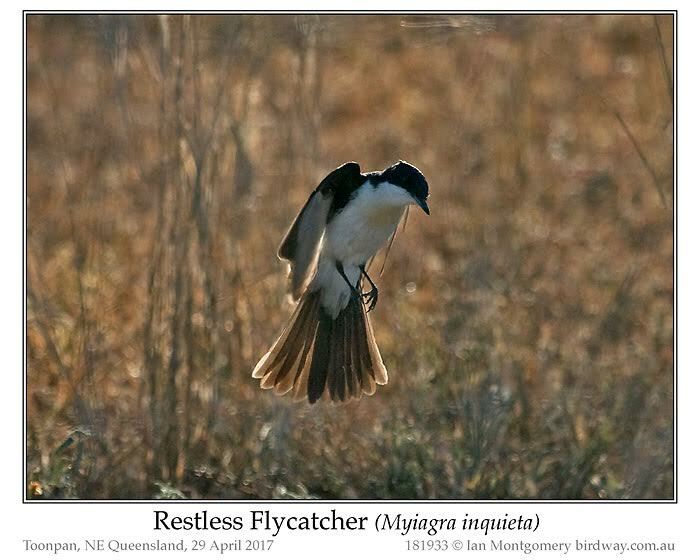 As with the Restless Flycatcher, both genders share in nest-building, incubation and rearing of the chicks. If we treat Restless and Paperbark as separate species, then the Restless is an Australian endemic, The Paperbark isn’t as it also occurs in southern New Guinea on both sides of the Indonesian-PNG border. Keep up the good work, Ian. We enjoy your birds whenever they fly our way. The bird of the week has, regrettably, been so irregular over the last year or so, that I can’t pretend anymore that it’s a weekly event, or even a monthly one for that matter. These days we’re supposed to achieve peace of mind by living in the now, I’ve renamed the series Bird of the Moment. 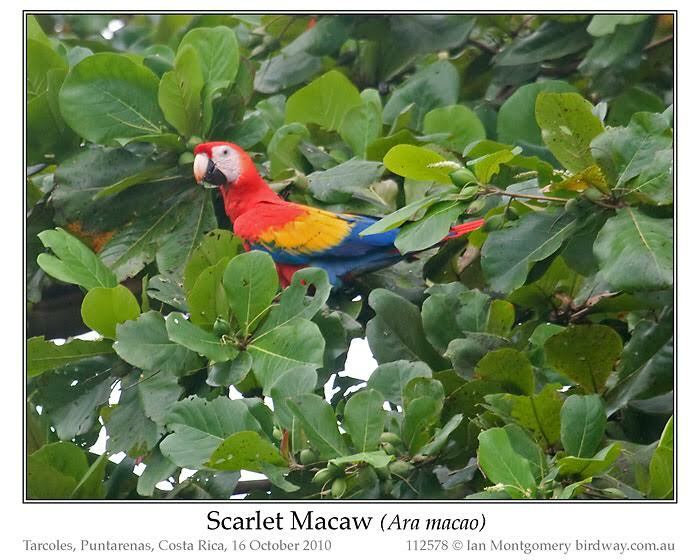 In the last one on Macaws, I finished with this photo of a Scarlet Macaw feeding on an introduced Terminalia tree in Costa Rica and mentioned that the fruit of same species (T. cappata) is equally popular with Red-tailed Black-Cockatoos along The Strand in Townsville. Here is a pair with the male on the right whispering sweet phrases to the female two days before Valentine’s Day: she looks very receptive. You can see the female has spots on the head, barring on the body and a barred panels in the tail against a background of red and yellow. 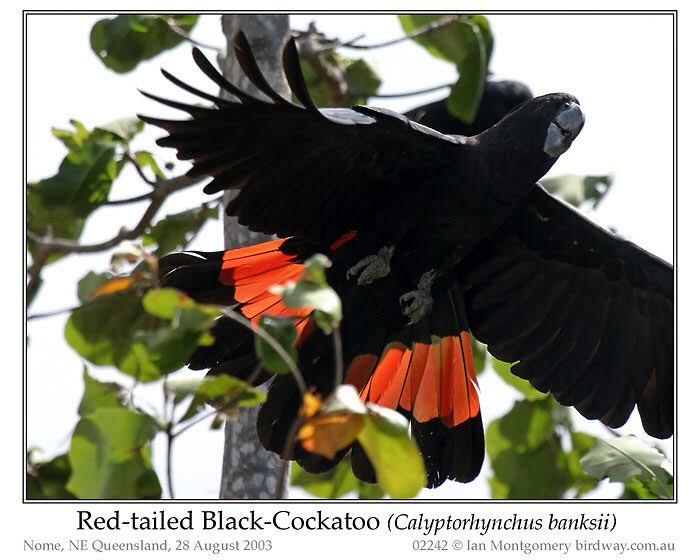 The male has glossy black plumage and scarlet, unbarred panels in the tail. These Cockatoos are quite common in the Townsville District and for me, it was love and first sight when I arrived here in 2002. 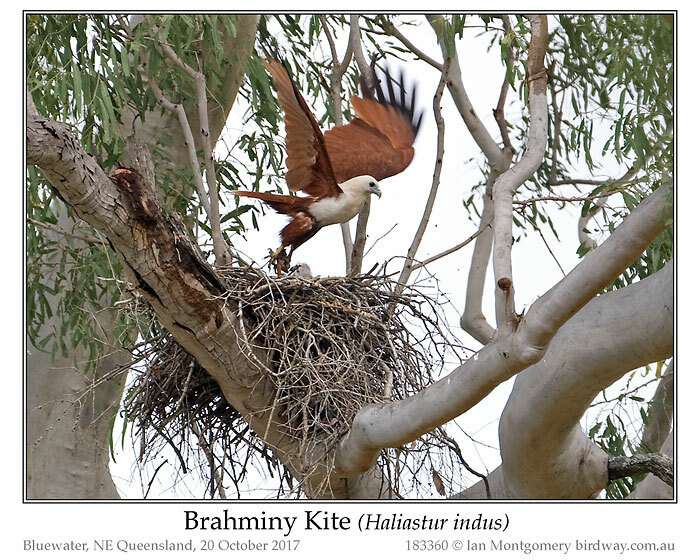 They are spectacular birds, very large (to 65cm/25in in length) with a wonderful leisurely ‘rowing’ flight, long tails and a permanent smile. 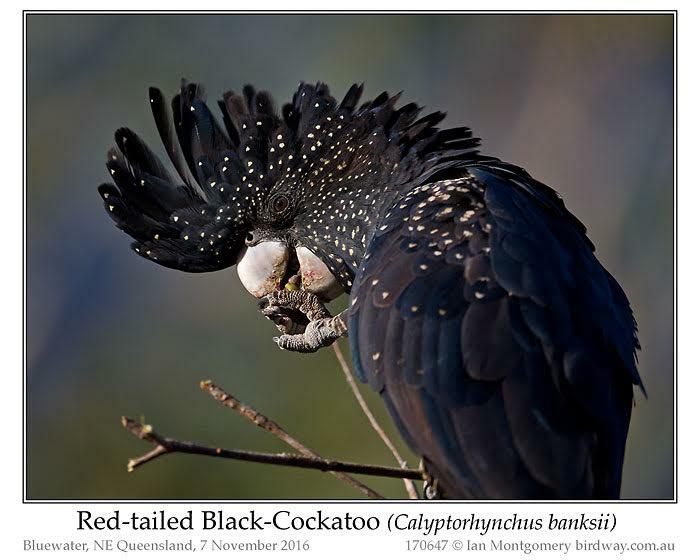 They are often heard before being seen both when perched and in flight, owing to their haunting, far-carrying, trumpeting calls, which are positively melodious compared with the ear-shattering screeches of their ubiquitous white relatives, the Sulphur-crested Cockatoo. They’re remarkably tame too and seem to enjoy being photographed. Terminalia grow readily from seedlings, and Jo Wieneke gave me some seedlings when I moved to Bluewater in 2013, which I planted with the sole aim of attracting these Cockatoos, above. These belong to a different species of Terminalia with smaller leaves and fruit. The fruit of T. cappata, the ‘Beach Almond’ are about the size of walnuts; these ones are more like smallish, hard, black olives. 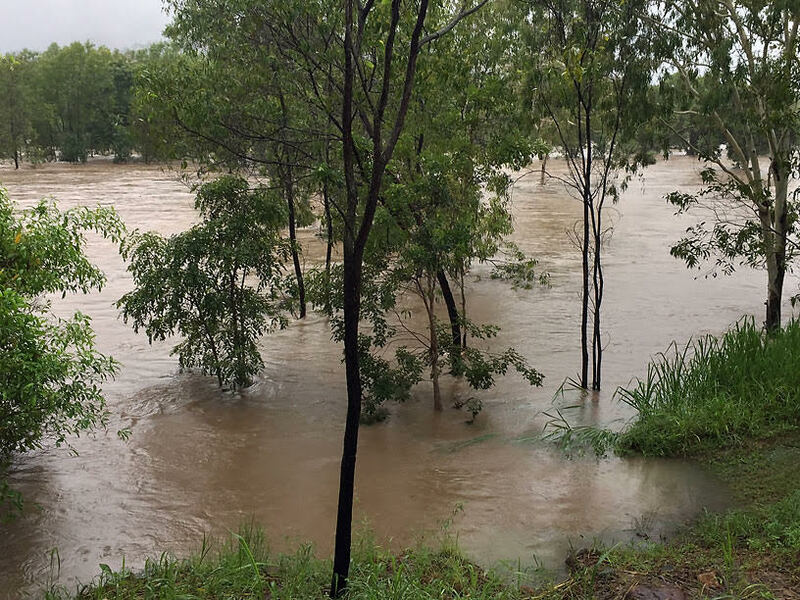 The three trees all lean to the left, a legacy of cyclone Yasi in 2011, called the ‘Yasi lean’. Since then the trees have tried to correct this defect by growing vertically at the base and the top – easiest to see in the left-most tree – and growing thicker branches on the right-hand side, presumably as a counter-balance. 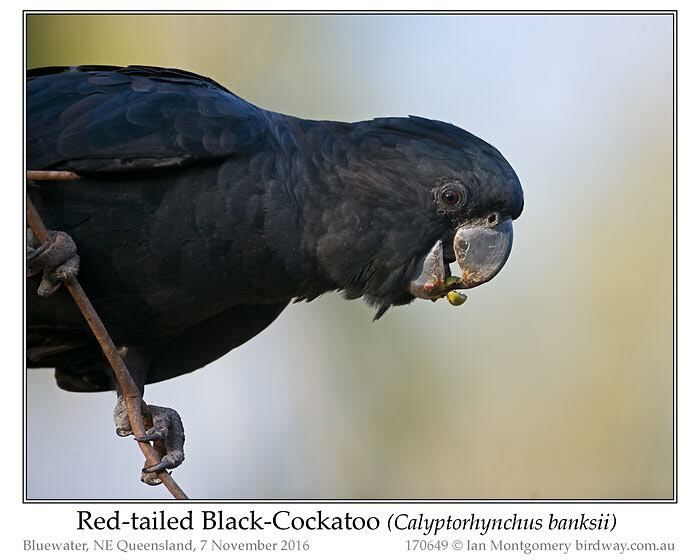 The trees started flowering and fruiting about three years ago, and I was delighted when they had their first visit from a lone Black-Cockatoo. Last November, the trees had an abundant harvest, and a pair of Cockatoos came each evening at about 4:30 pm (and maybe before I surfaced in the morning) and thoroughly until they had completely stripped all fruit. 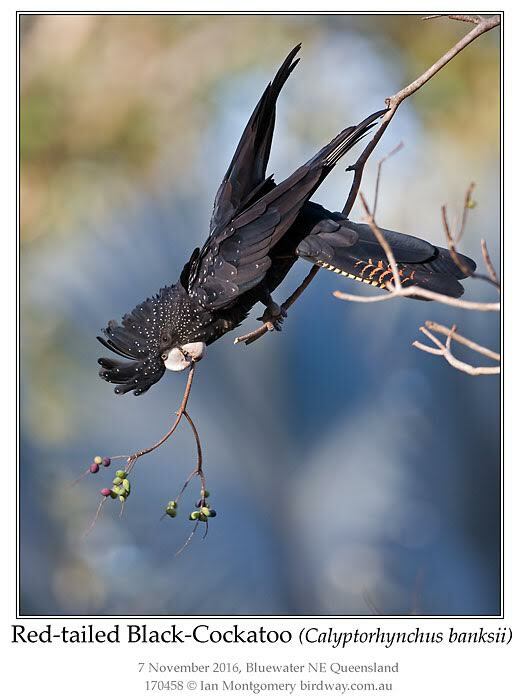 The birds are wonderfully acrobatic (below) and their preferred way of eating is to snip off a twig, hold it in one foot, stand on the other foot, prise open the hard shell to get at the kernel in the middle and discard both the shells and the twigs. The shells are quite hard and I cut one open to see what was inside and found the kernel is tiny, so it seemed like a lot of effort for a relatively small reward. In the photo below, the male is using the pointed tip of the upper mandible to extract the kernel from the cracked shell. They drop a lot of unopened fruit and several months later a small flock of cockatoos came round to feed on the ground under the trees. 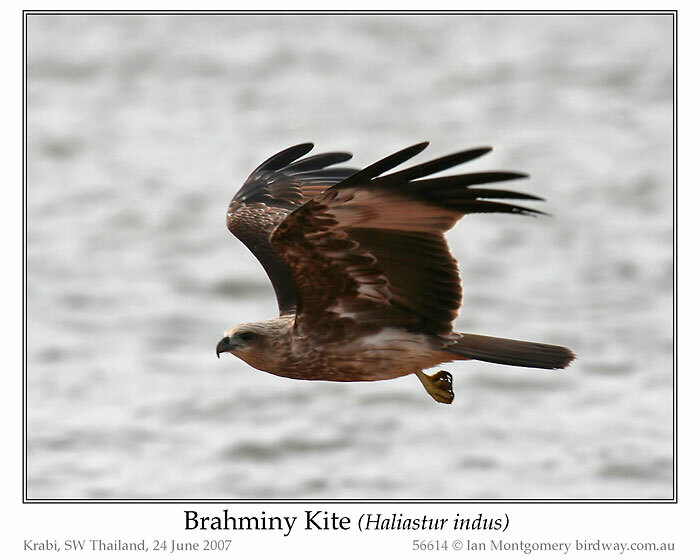 The coloured panels on the tail are not easy to see except when the birds spread the tail feathers, either when taking off, landing or doing a sudden manoeuvre in flight. Presumably, it is an important signal to other members of the flock. 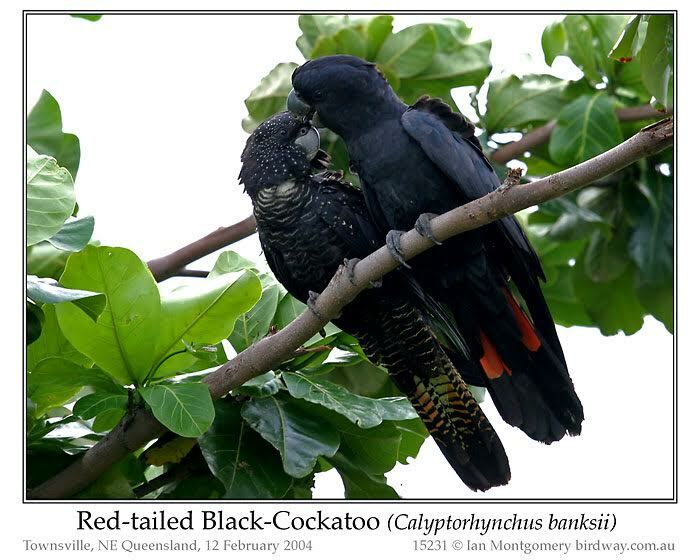 Black-Cockatoos seem to form long-term pair-bonds which are maintained even when they flock, so I wonder whether the variability in the colour of the panels of females (the one below has much red and little yellow) help the males identify their mates. The next photo shows a male just after take-off and showing his red panels to best advantage. Here is a female on the beach at Horseshoe Bay on Magnetic Island. She looks as if she’s contemplating a swim – you can see the edge of the water in the background – but it is more likely that she is looking for fruits from the casuarinas growing along the foreshore. 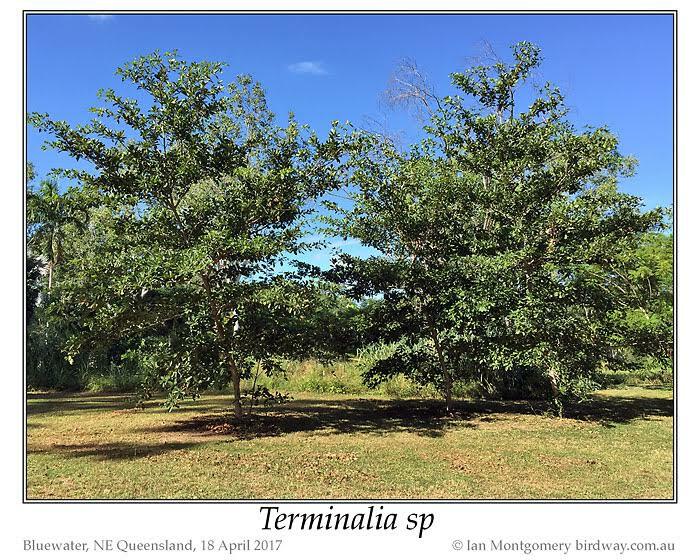 In the absence of introduced Terminalia trees, the birds feed on the fruit of native trees including those of Eucalyptus and Pandanus. 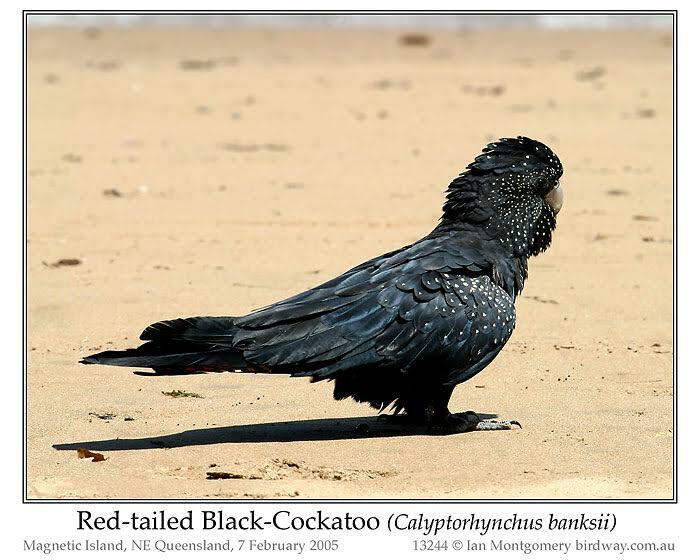 The Red-tailed Black-Cockatoo is the most widespread of the five species of Black-Cockatoo, all of which are Australian endemic.s (I’m not including the Palm Cockatoo which belongs to a different genus and occurs in Cape York and across New Guinea.) 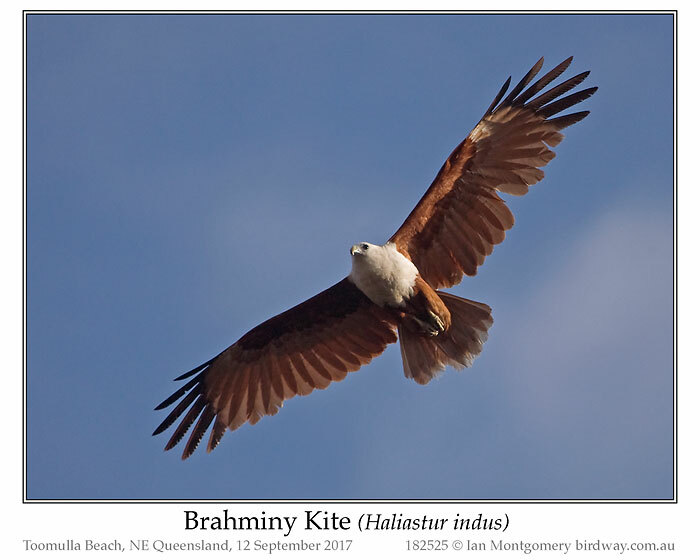 The other four species are the Glossy (eastern Australia); the Yellow-tailed (eastern and southern Australia and Tasmania) and the Long-billed and Short-billed (both have white tails and are restricted to SW Western Australia). 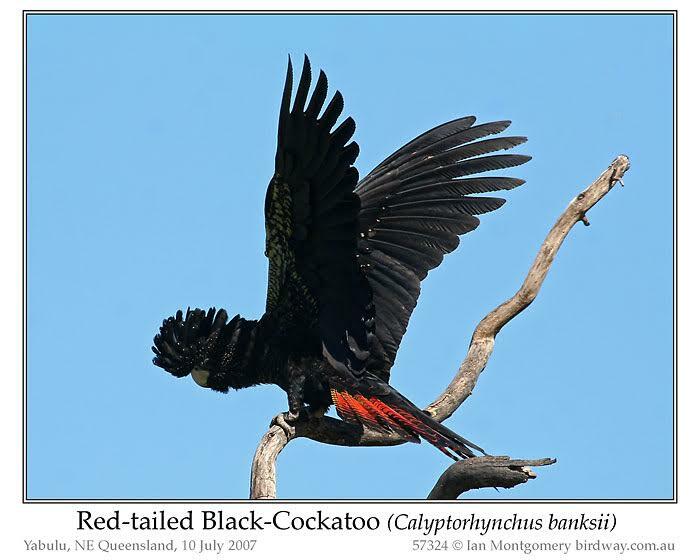 The Red-tailed has five subspecies which differ in size and in the colour of the tail panels in females: the largest, nominate race banksii (Queensland and northern NSW); the large-billed macrorhynchus (Northern Territory and NW Western Australia); the smaller samueli in central Australia; also in (SW Western Australia); and graptogyne (western Victoria and SE South Australia). 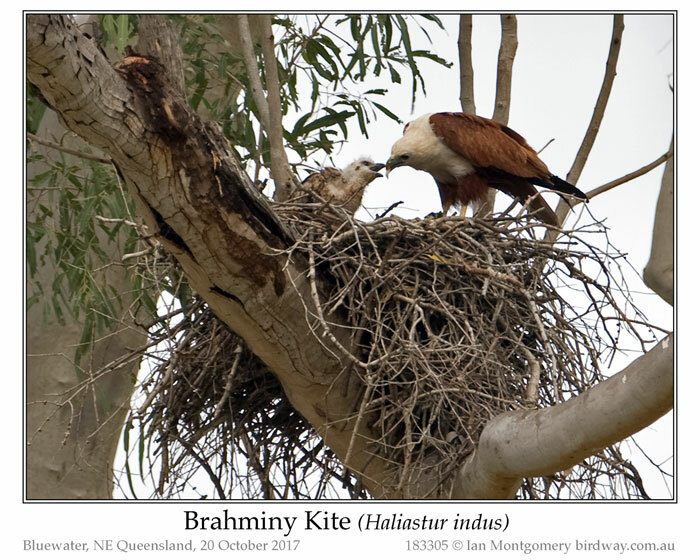 The three birds in the last photo belong to the large-billed race macrorhynchus, and presumably are a family with the female on the left and the male on the right. 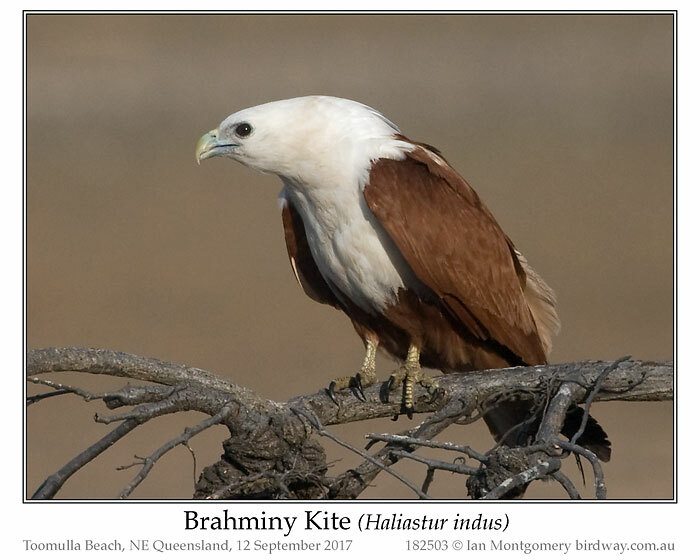 The bird in the centre has female-like plumage but a black bill – females have whitish bills – so is probably a juvenile male; juvenile males take about four years to acquire the adult male plumage. 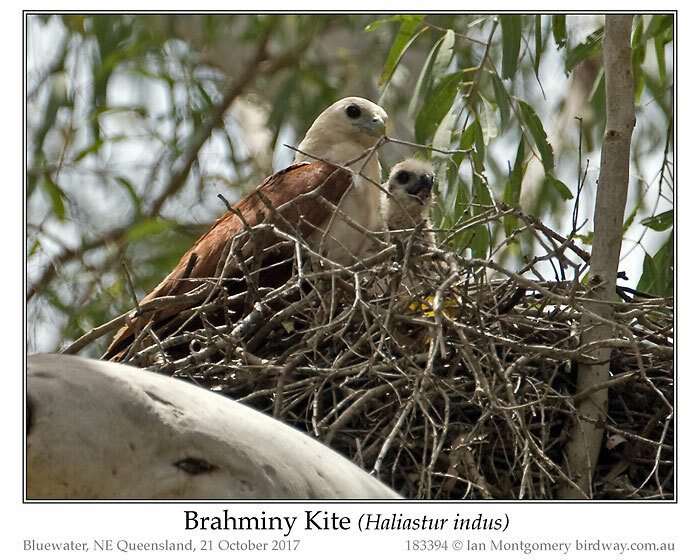 Family bonding would appear to be important and you often see these birds in groups of three. I’ve been slack about the Bird of the Moment; I have however been working on the website. 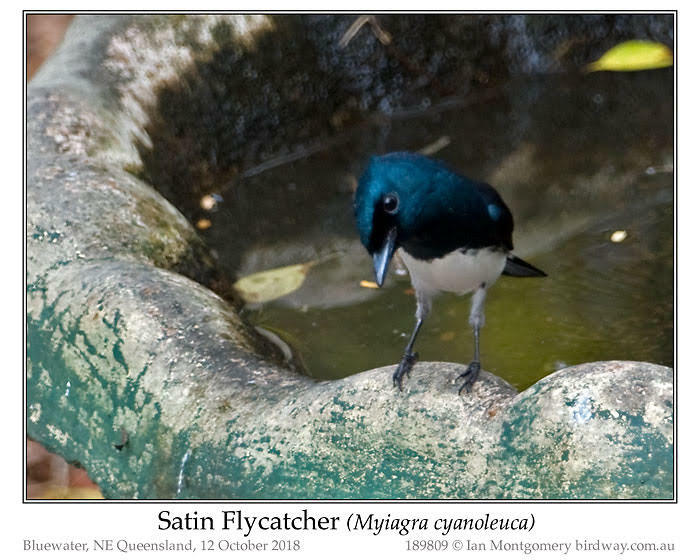 The latest inclusions include a gallery of Dragonflies and one of Butterflies and Moths, and there are various additions to the bird galleries. Thanks, Ian, for an update. I had begun to think you were not able to provide any more of these great articles for us. You are missed when we fail to hear from you. Not sure if you readers were aware, but Ian has been dealing with a serious eye problem. That is difficult for such a good photographer to deal with. Glad he is improving so he can keep us informed about God’s amazing flying avian wonders.